Do you find it difficult to remain on a diet? Do you eat more than you should? Are you emotionally attached to food? Are you constantly thinking about your weight? If your answer is ‘yes’ to any of the above questions, then chances are that you are a food addict! Food addiction or compulsive eating disorder is a condition which causes a person to become obsessed with food. 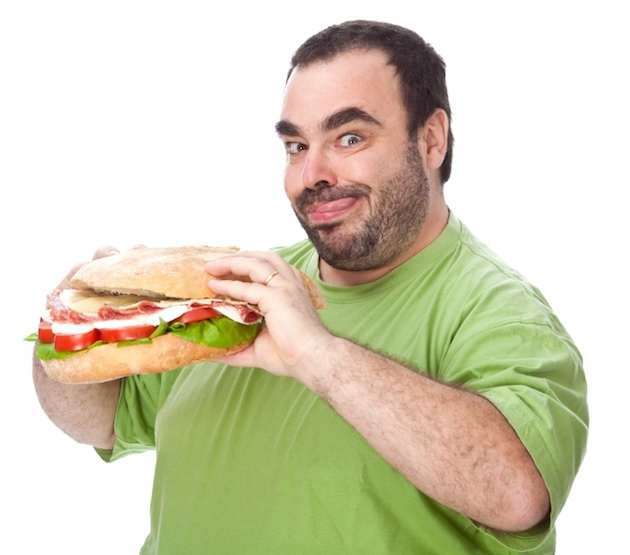 A food addict regularly eats even after he or she is full. A number of factors such as stress, physical or emotional abuse, mental illness and body dysmorphic disorder contribute to food addiction. When we eat high calorie foods such as sweets and bacon, our brain develops ‘feelings’ towards such foods and tells the body to eat as much as it can. This might have been essential for evolution – especially when food was scarce. However, in today’s world food is readily available and food addiction can be highly detrimental to the overall health of an individual. The most common types of food addictions include caffeine addiction, sugar addiction, soft drink addiction and addiction to fast foods such as pizzas, burgers, fries and so on. The biggest problem with food addiction is that people find it difficult to realize and to accept that they are addicted to food. What are the ill effects of food addiction? 1) Ill effects on health: There are 3 different stages of food addiction – early, middle and late. If left untreated, food addiction may trigger a host of conditions such as morbid obesity, diabetes, hypertension, osteoporosis and many more. Obesity is the number two cause of preventable death in the US but still close to half a million people fall prey to it every year. The American Diabetes Association states that a staggering 25.8 million people in the US are diabetic. 2) Ill effects on self esteem: When you eat uncontrollably, you develop feelings of guilt. It is almost as if you are losing control of your life. Food addiction leads to depression and depression leads to aggravated food addiction. Your self esteem goes for a spin and social life suffers a blow. 3) Ill effects on relationships: A low self esteem and poor health take a toll on your relationships. Since you cannot accept yourself, you find it difficult to believe that someone can accept, respect and love you. If you are already married and addicted to food, then your partner may develop an aversion towards you or you could be setting a bad example for your children. Failed relationships cause stress and depression which further worsens your food addiction. 4) Ill effects on professional life: Many professions require you to work in high tension environments such as factories, airplanes, oil rigs, ships and so on. These jobs require you to be in top mental and physical condition. if you do not get rid of your food addiction, then ultimately you will fall ill and will be deemed unfit for such jobs. Even if you work at a place where your physical fitness does not matter, still you are not projecting yourself in good light – if you cannot take responsibility for personal health, then how can you be expected to work responsibly and efficiently at work? Scientific research suggests that obese people find it more difficult to get a job. Anyone who disagrees is just being politically correct. What are the remedies for food addiction? 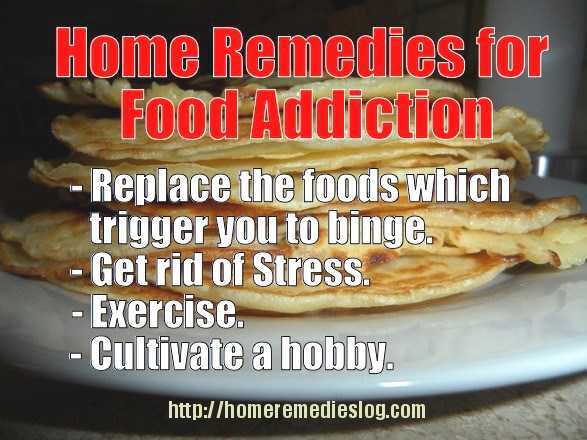 Food addiction has no single remedy. You need a holistic approach in order to take care of this problem. Mentioned below are some easy to implement remedies for food addiction. These work best when used in conjunction with each other. Remedy 1) Replace the foods which trigger you to binge: Every person has a weakness for certain foodstuffs. Identify the foods which trigger binges. If you are addicted to sweets such as chocolates, cakes and cookies, then replace them with fruits and dates. If your food addiction is coffee, then replace it with green tea. If you are addicted to soft drinks, then replace them with coconut water, fresh fruit juice or simply water. 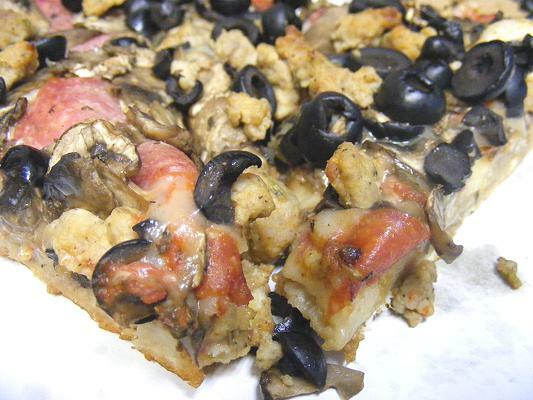 Bake instead of frying and eat lean cuts of meat instead of bacon and hamburgers. Try to find a healthier alternative to the foods that cause you to eat excessively. Research suggests that if you stay away from ‘trigger foods’ for a period of 21 days, then your body will lose its emotional attachment to those foods. Remedy 2) Get rid of Stress: Food addicts use food as a way of dealing with stress and to escape into an imaginary state of comfort. Just like alcohol addiction, the brain starts associating food with ‘good times’. The best way to deal with this is to reduce the amount of stress in your life. Spend quality time with friends and family, listen to your favorite music or take up yoga or meditation. These activities are highly cathartic and will enable you to feel better – physically, emotionally and spiritually. Even breathing deeply for a few minutes every day can help you to relax. 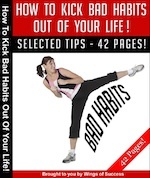 Remedy 3) Exercise: When we exercise, the brain releases chemicals known as endorphins. These chemicals trigger feelings of elation and joy. Hit the gym, go for long walks or engage in your favorite sport. Apart from getting rid of food addiction, exercise will also help you to enhance your body image and boost your confidence levels. Remedy 4) Cultivate a hobby: Doing something you love will keep you busy and you will not think about food constantly. You tend to eat a lot more when you are bored or have nothing to do. Do not turn eating into a source of entertainment. Reading, trekking, gardening, dancing are all very rewarding hobbies and will definitely assist you in combating your addiction to food. Author Bio- This post has been written by Adam Jones. He loves to write about Health and Fitness. He recommends bariatric vitamins and supplements from Bariatric Choice Company as a great source of vitamins. Enroll with the every week home remedies news letter and obtain home treatment and holistic health-related pdfs one supplied to your inbox every week scot-free!. 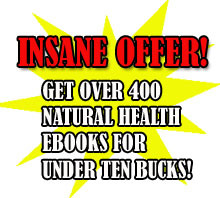 If you purchase my unique book, “The Big Book of Home Remedies” you may also get prompt admission into our confidential members location and that allows you to download and install any one of our 410 and more all-natural health-related ebooks absolutely free. Adam Jones loves to write about Health and Fitness.